I ordered 12 rumparooz during my pregnancy and now that my son is 9 months old my stash of these has increased to 25. These are the first diapers my husband and I reach for. They are trim, absorbent, and very cute. They have been the best fitting diaper in our stash from birth at 9 lbs through now when he is 22 lbs. 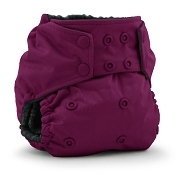 The double gussets are amazing for EBF poop! Never a single leak! Tons of options here with this diaper. It tries to be everything in a diaper all at once which makes it super bulky on the smallest setting. Even with only using the newborn insert, you have to stick it out the top front because the inside is larger than the snapped down rise. It's an awesome diaper, just too much. If you only want one kind of diaper for your whole stash this is the one to get. 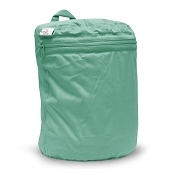 It fits tiny newborn well and includes so much to grow with them. Very soft and washes well. This is my go to night time diaper. The amount of absorbency is crazy in these bad boys. Double gusset really does keep everything inside. Had a couple small leaks out the legs until I realized that once on the largest rise setting you want to change to the large (boy in my case) setting otherwise there is too much bulk up top and a little gap appears.I remove a star as I am suspicious that this is not going to fit my 5.5 month old much longer. He is tall and muscular (20lbs). Time will tell. This diaper is cute, thirsty and screams quality. That being said it is way to bulky. I am all for a fluffy bum but when I tried this diaper on my little man he walks like a cowboy and wasn't impressed. PROS: Thirsty inserts (Lasts through nap time, haven't tried it out at night yet), Inner gussets, ADORABLE Prints and solid colours, Coloured snaps to match, Uber soft interior, Four rows of rise snaps to fit from a young age, Washes nice and looks good. Cons: Bulky, Stuffs from the back; might have to touch poo to get insert out, Inserts are snapped together so you ultimately have to hands dirty, have to buy hemp or bamboo inserts separately , Seems small? Already on the the largest rise. I think these diapers are as close to leak proof as any diaper can be! The double gussets have stopped many an explosive poo - the inner gusset slows down the velocity so that the outer gusset has a good chance of being an impassable guard. LOL. On my newborn they seemed a bit bulky but started fitting great at 1 month of age. When you stuff them on the smallest rise setting, the insert seems too long - but trust the diaper, when you go to put the diaper on baby it all works out. Great diaper overall. 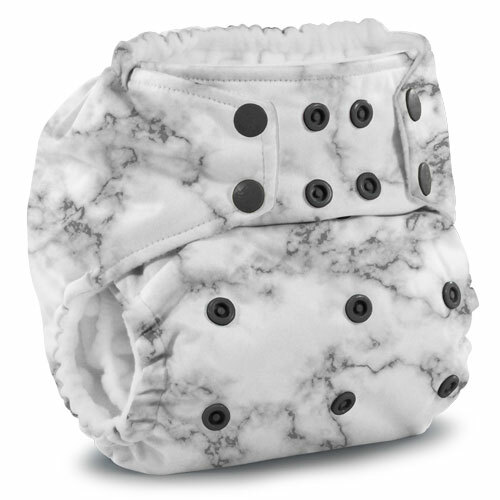 Double gussets are awesome for exclusively breastfed poop and the snaps are great quality. Plus they have plaid prints! These diapers are awesome! Never a leak, even with my heavy wetter. This diaper makes up the majority of my stash now! I've used these from 3-6 months so far and they fit my little guy with lots of room to grow. Absorbency with just the new born insert has worked well for us until now. We've gotten so many compliments on the patterns - so bright and attention grabbing! I wish they had a hip snap as well though. These diapers are a wonderful quality and definitely one of my favourite brands. I love the softness of the TPU and my little one's very sensitive skin does noticeably better in these than in diapers made with PUL. I love the double gussets and how the inner fleece has stayed plush after several months of use - the construction is top notch. The included inserts are very nice, although I now use bamboo trifolds from another brand in all of my pocket diapers - just my preference. These fit my son very well and I expect they will last him into toddlerhood no problem - although he is smaller-than-average. The prints and colours are among my favourites for sure. Even though they are pricier than some comparable diapers, I keep coming back for more because I just love their quality and how cute they are. If you are building a stash, I would recommend taking advantage of buying at least six at a time to save some money. I've try several cloth diaper's brand and yet they're the best ! My other diapers are falling appart but the rumparooz (been use on 2 child) i bought only rumparooz to replace the others. i love them ! I'm pretty confident i could use them on 2 other baby, if we're having more :P If i knew.. i would have bought those in the first place !